TNT Magazine’s Golden Backpack Awards have named a Noosa hostel as the best in Australia. The YHA Guest House “Halse Lodge” boasts four stars on TripAdvisor, and a score of 87 percent on hostelworld, with guests rating the location, atmosphere and cleanliness each at 93 percent. These impressive stats may have something to do with the fact that this 1880s National Trust and Heritage-listed Lodge sits on two acres of gardens and rainforest, and is still only 100m from the beach. If that wasn’t enough, this awesome hostel even lends out surfboards and bodyboards (free of charge!) for their guests to enjoy the beautiful Noosa waves. Noosa has become something of a hotspot for adventurous backpackers in Australia. On the main beach you can choose from a variety of watersports such as kite surfing, jet skiing and scuba diving, while the surrounding area offers mountain biking, horse riding and even a flight simulator! For the slightly weaker-at-heart, there is no shortage of nice walks, decent food, interesting markets and tanning space on the sand. Click here for more information about where to go and stay in Noosa. 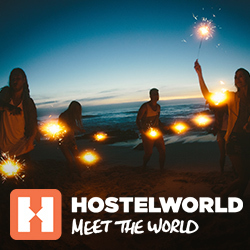 To book a bed at Halse Lodge, go to halselodge.com.au or book through hostelworld.